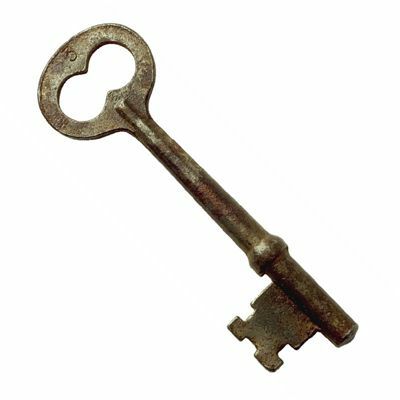 keykey1 /kiː/ ●●● S1 W2 noun [countable] 1 lockD a small specially shaped piece of metal that you put into a lock and turn in order to lock or unlock a door, start a car etchouse/car keys I lost my house keys. A bunch of keys hung from his belt.key to I can lend you a spare key to the store until you get one cut (=made). ► Don’t say ‘the key of’ something. Say the key to something. → master key2 → the key3 computerAPMT the buttons that you press on a computer keyboard to operate the computer Press the ‘Escape’ key to exit.hot key/shortcut key (=a special key on a computer, that does specific things)4 music a) [usually plural] the wooden or metal parts that you press on a piano and some wind instruments in order to play them piano keys b) a scale of notes that begins with one particular note, or the quality of sound this scale has a tune in the key of A minor5 map/drawingEXPLAIN a list of the signs, colours etc used on a map or technical drawing etc that explains what they mean6 testTCANSWER/REPLY the printed answers to a test or set of questions in a book7 island [usually plural]SG a small flat island, especially one that is part of a group near the coast the Florida KeysCOLLOCATIONSADJECTIVES/NOUN + key a spare key (=an extra key)Never hide your spare key under the doormat.door keyI’ll get a new door key cut for you.car keysShe left her car keys on the hall table.house keysI’ve lost my house keys.the front/back door keyShe felt in her pocket for the front door key.the ignition key (=the key that starts a car or engine)Sam turned the ignition key and drove slowly away.phrasesa bunch/set of keys (=a group of keys kept together)He took out a huge bunch of keys and unlocked the door.the key to a door/house/cupboard (=the key that opens a door/house/cupboard)Has anyone seen the key to the garage door?verbsput a key in a lock/the doorI put the key in the lock, but it wouldn’t turn.insert a key formal (=put it in a lock)She inserted the key into the lock.turn a keyHe climbed into his car and turned the key.cut a key (=make one)Could you get a key cut for me?jangle your keys (=move them so they make a ringing sound)He walked off down the corridor, jangling his keys.a key unlocks/opens somethingThe largest key unlocks the front door.a key turnsWe heard the key turn in the lock. key• Secondly, the computer keyboard has many additional keys which are used to alter the function of the alpha-numeric keys.• Type in your PIN code, then press the ENTER key.• Then she saw a little glass table with three legs, and on the top of it was a very small gold key.• a minor key• My plastic key wouldn't open my hotel room.• Any set of search keys for a document can be described as a document profile.• These socialist writings showed me the key to my environment.spare key• It had temporarily slipped my mind, but some one did have a spare key some while ago.• Leave a spare key with a trustworthy neighbour.• So this was his spare key, the one he kept at the Vicarage.• Remember that I had always intended to leave spare key with the Twills next door but never got round to it.• Do you leave spare keys in hiding places outside the house?• Eventually, the spare key was found and they were released from the clutches of the car.• Soon she took my visits for granted and I was given the spare key to let myself in the door.keykey2 ●●○ S3 W2 adjective [no comparative] IMPORTANTvery important or necessary China’s support is key to the success of the coalition.key factor/points/questions etc The president makes all the key decisions on foreign policy.key role/player/figure etc (=one with a lot of influence on a result) The show has been hit by the departure of key personnel.► see thesaurus at important, main → low-keyCOLLOCATIONSnounsa key factor (=a very important factor)A key factor in starting any business is its location.a key element/feature/component (=a very important part)Advertising is a key element in the success of a product.a key roleSanders played a key role in the team’s winning season.a key areaWhat are the key areas of economic policy?a key issue/question/pointThe environment became a key issue during the election.a key figure (=a key person)She was a key figure in the election campaign.a key playerHe won’t leave key players out of the team.a key witness (=someone who can give important information about a crime)She will be a key witness in the murder trial.a key decisionWomen made most of the key decisions about how money was spent in the household.a key word (=an important or useful word)Once you know the key words, you can make your own sentence.